Working with our sister Indivisible groups in MA we have selected seven districts, and in many cases candidates, to focus on with a myriad of tactics for the important 2018 Mid term elections. We need your help to narrow to 3-4 candidates for complete focus in Red districts that are deemed ‘swingable’. Join us as we launch this program. Please RSVP at strength@marchingforwardmass.com as space is limited. Marching Forward considered supporting Anthony Brindisi, a Democratic candidate for congress in up state New York around Utica, but found he is endorsed and supported by the NRA. This is not acceptable to us, especially in light of the recent events in Florida. He may otherwise be an excellent candidate, but we felt we should draw a line in the sand on this issue. We are sending the following letter to him with a copy to the local and national Democratic party. We have moved to focus support PA Conor Lamb Campaign and special election 3.13.18. 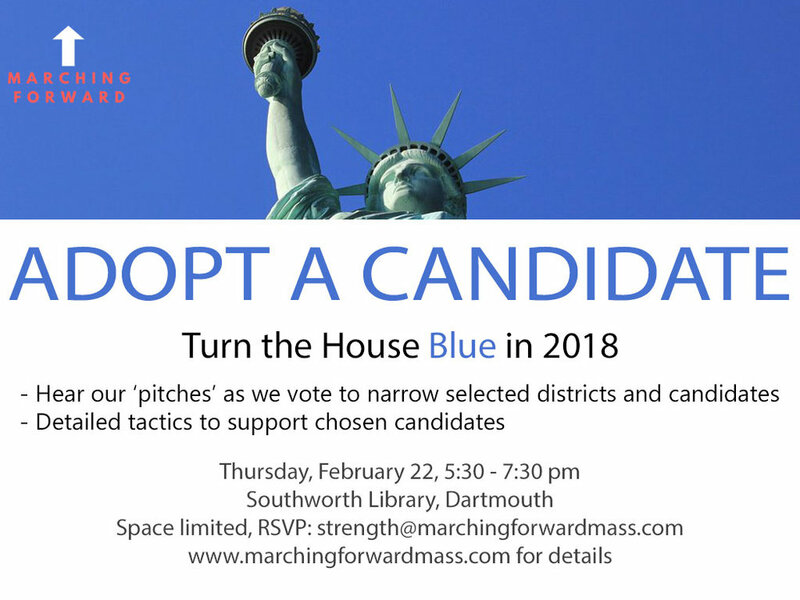 We are a group of nearly 500 activists from the SouthCoast of Massachusetts who are trying to make a difference in these troubled political times. We have considerable resources at our disposal that we plan to use to further the liberal cause. The entire Massachusetts congressional delegation is Democratic, so we are looking elsewhere for our efforts. We identified your district as a potential race to support. Unfortunately, we noticed that you received an endorsement from the NRA. Our view is the NRA has become an organization that enables, if not encourages, mass murder for profit of the arms industry. The NRA uses its financial and political strength to buy politicians that block common sense restrictions to gun sales via background checks and that demands that sales of weapons of mass destruction, such as assault rifles, continue in the misguided argument that these restrictions would undermine the second amendment. The majority of United States Citizens support these measures, as do we. Because of your endorsement by the NRA, we can not support your candidacy. If you renounce their support and return any money they donated to you, we will be happy to reconsider. Until then we turn to two Pennsylvania districts and candidates who serve ‘purple’ districts similar to your district yet have not accepted gun lobby money. We look forward to your reply and will post on our social media platforms. Sign up here at their website: https://www.marchforourlives.com/march.